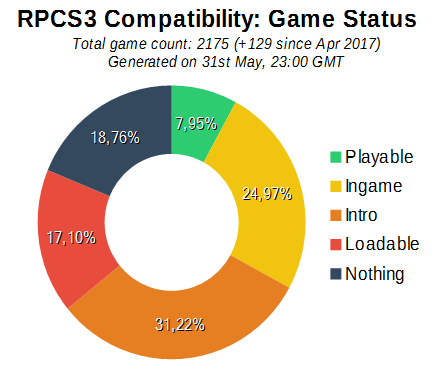 May was a very eventful month for RPCS3 as we saw significant core and performance improvements. The goal of this progress report is to highlight some of the more notable or interesting developments of the project. The report will start by showcasing a selection of games that were improved in one way or another. Thereafter we will summarize what work each contributor did this month. The short version is that kd-11 is an extremely talented graphics developer who has helped RPCS3 since January of 2016. Without his work RPCS3 would not be here today. It goes the other way around too of course, without the significant core accuracy and performance improvements by Nekotekina we would not be here today either. Therefore it make sense for two great minds to join forces. With the generous Patreon support kd-11 will be able to acquire new hardware for development and testing. On the short term purchasing list is a modern NVIDIA GPU, a modern AMD GPU, and possibly a Skylake+ laptop of some kind. This would allow kd-11 to fix specific issues on these platforms. Not many people use RPCS3 with integrated Intel graphics but they are technically fast enough (for now at least). The problems lie in very very buggy Intel graphics drivers which is why it would help to have direct access to it. Check out this video below, it highlights some games that saw performance improvements from “the secret build” which was a huge general graphics rework, with focus in particular on Vulkan.